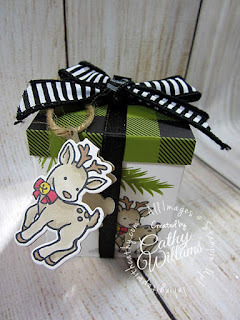 Here is another holiday idea for gift packaging. This little box is large enough to put a gift card in if you want. It is also a pretty quick and easy project except for the coloring. If you don't have too much time, just find a stamp that doesn't require coloring. However, this little reindeer is so cute that I just have to show him off as much as possible!